Boston’s 19-game winning streak was a franchise record and tied for fourth longest in NBA history. At 27-2, the Celtics had the best start to an NBA season. LOS ANGELES – The six-month wait is over. The Los Angeles Lakers can put the anguish of losing the NBA finals to the Boston Celtics and the embarrassment over the way the series ended behind them. 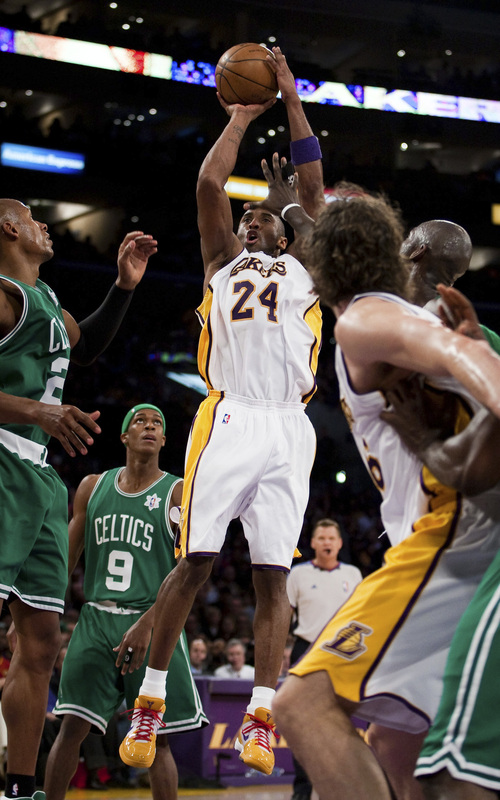 Kobe Bryant had 27 points, nine rebounds and five assists, Pau Gasol scored seven of his 20 points in the final three minutes, and the Lakers used a strong finish to beat Boston 92-83 Thursday, snapping the Celtics’ franchise-record 19-game winning streak. The game was the first between the teams since the Celtics romped to a 131-92 victory in Game 6 of the finals last June to win their first championship in 22 years and league-high 17th title. The Lakers blew a 24-point second-quarter lead in Game 4 at Staples Center to fall behind 3-1 – a deficit that’s never been overcome in the finals. The teams have been rivals since the 1960s, having met 11 times in the finals, with the Celtics going 9-2. “We’ve been waiting for that opportunity for a long time, and we won,” said Lakers guard Sasha Vujacic, who scored 10 points. “I don’t like them at all. A lot of people called us softies or whatever. It doesn’t matter at all. We know what we can do. The victory was the 1,000th for Los Angeles’ Phil Jackson, making him the sixth NBA coach to reach that milestone. The 63-year-old Jackson has a career record of 1,000-423 in 17-plus seasons as coach of the Chicago Bulls and Lakers. He became the fastest to win 1,000 games, surpassing Pat Riley, who did it in 1,434 games. The Celtics entered with a 27-2 record – the fastest start by a team with two or fewer losses. They were in pretty good shape when Kevin Garnett dunked off a feed from Rajon Rondo to put them ahead 81-79 with 3:57 remaining. But the Lakers went on a 13-2 run to finish the game. Gasol missed his first four shots, and showed frustration at times. But he made all three of his shots and all three of his free throws in the fourth quarter for nine of his team’s 21 points. “We were pretty physical,” said Gasol, who had three rebounds, five assists and three blocked shots. “We were able to contain them, keep our poise and finish the game off. I had to make sure I took it to them, not settle for easy jumpers. I’m glad I was able to get over that hump of a slow start. Lamar Odom had 10 points and seven rebounds for the Lakers (24-5), who won their 12th straight game at home, where they’re 15-1 this season. Andrew Bynum, who missed most of last season and the playoffs with an injured knee, had nine points and seven rebounds. Garnett shot 11 of 14 in leading the Celtics (27-3) with 22 points and nine rebounds. Ray Allen scored 14, but went 2 of 11 after making his first three shots. Rondo was held to six points, shooting 3 of 11, but had 12 assists. Boston’s Glen Davis returned after missing two games because of a concussion sustained in a traffic accident last Sunday, adding four points and four rebounds.